Firmly canonized in high school curriculums for many decades, Shirley Jackson’s short story “The Lottery” (1948) has been read by many millions. Set in a small American town that every year randomly selects and stones to death the unlucky loser of a lottery, the “The Lottery” is rich with mythical and biblical symbolism while posing interesting questions about mass psychology — almost perfectly suited to generate lively class discussions and essay topics. From my Brighton High School English class, I still remember how well the story — via displaced sin and stoning — illustrates scapegoating. A few years ago, I was in an 8th grade social studies class at Edison where we reenacted a version of the lottery — each choosing paper slips from a hat in which just one was marked with a black dot. When no one really stood up for the victim, we learned a chilly lesson in social conformity. Less well known is that Jackson herself graduated from Brighton High School in 1934, and then attended the University of Rochester for two years. Only at Brighton High for about a year and a half, very little is actually known about Jackson’s time in Rochester. 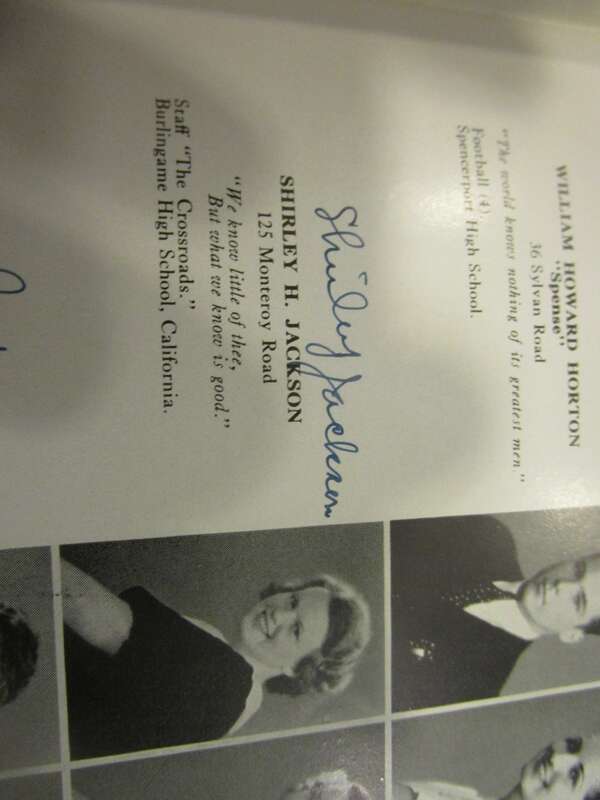 We have Jackson’s signed yearbook picture and we know she lived on Monteroy Road near Highland Drive. Jackson herself wrote almost nothing about her teenage years. Apparently, there are no letters or diary entries — if they existed — from that time in her life. As reported in a recent D & C story, the critic Ruth Franklin tried — but failed — to discover more. 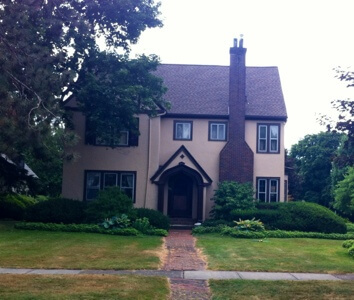 See Shirley Jackson Road Trip Day 1 describing Franklin’s quest. My own quest for Shirley Jackson took a circuitous turn. When researching In grand fashion, Brighton celebrates its volleyball champions I saw an old volleyball trophy from 1956. 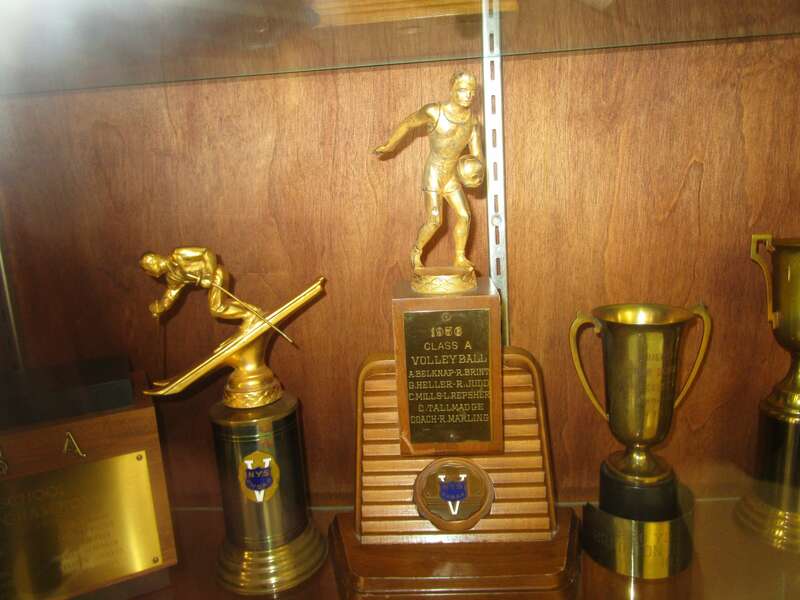 From the janitorial supervisor, I learned that several bookshelves and boxes of old trophies were stored in the school attic. In search of gold, we picked our way through the trophies and memorabilia, discovering one box containing the oldest ones dating back to the 1930s. My heart leapt at one dusty plaque that seemed to read: Award of the Class of 1934 for Fine Arts. Knowing that Shirley Jackson was BHS ’34 (and a fine artist), was this an extraordinary literary strike?! Alas, when the dust was cleared, the dream faded as we saw that the year was actually 1935. Nor was Shirley’s engraved name to be found. 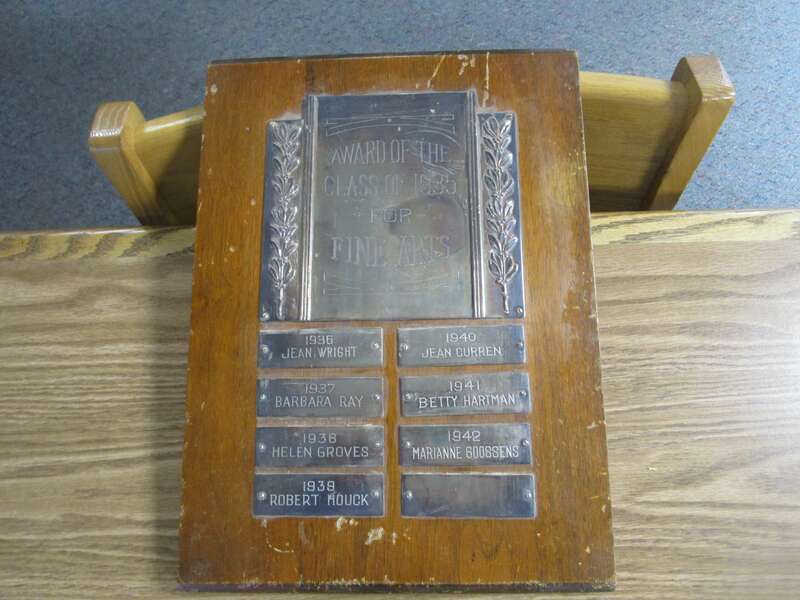 Still, we had almost surely found the oldest existing Brighton High School plaque/trophy. 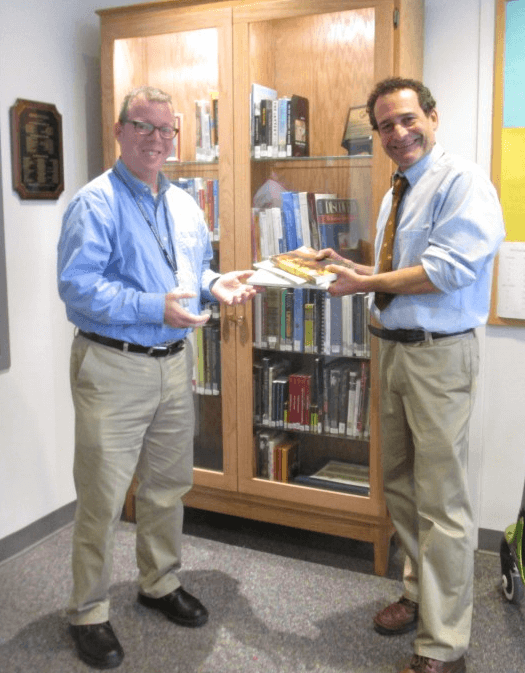 We took the plaque to the school library where I met its director, Howard Enis. The library was as bustling now as it was during my time back in the 80s. And, I made a discovery that softened the blow of the 1935 Fine Arts Award. Last year, an attractive display bookshelf holding the work of BHS alumni was placed in the library. Jackson’s works were understandably the centerpiece, but I had no idea my fellow alums were so prolific. 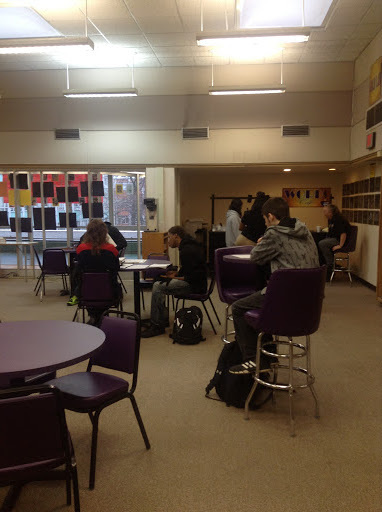 In the Fall of 2014 the Brighton Student Alumni Association (BSAA) began planning for a BHS Library Enhancement project. The project would entail raising money to help update, renovate, and improve the Library Media Center in honor of long time member and co-president Henry ‘Pete’ French, BHS ’53. Over $30K were eventually raised. Items purchased include a beautiful glass art piece designed and implemented by BHS alum Nancy Gong, as well as new carpet, furniture, lighting, and a custom made display cabinet for the library foyer. This cabinet is intended to be used to showcase over 200 volumes of books authored by BHS alumni, as well as items memorializing Pete French. In June of 2015 a ceremony celebrating this project including an unveiling of the glass art piece was held in the BHS library. Very kindly, Howard offered to house three of my own academic essays from Southern Studies, War, Literature and the Arts and The Henry James Review. Speaking of prolific BHS alumni authors, Dr. Stephen Shapiro ’82 teaches English and Comparative Literary Studies at University of Warwick in Coventry, United Kingdom. Stephen visits Rochester when can and has offered to donate some of his own books to the BHS Library Project. 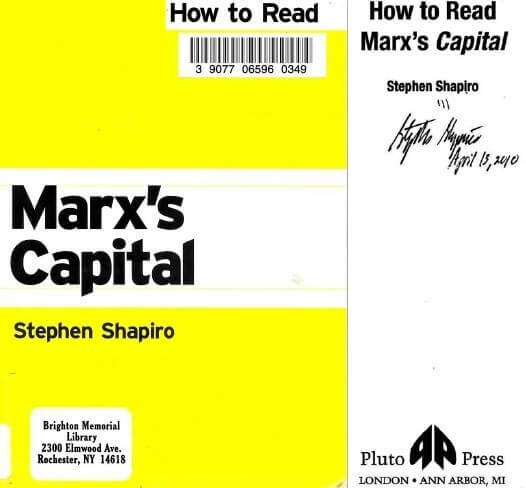 Below is a signed copy (my idea) of his book on Marx donated to the Brighton Memorial Library. TEASE: in a couple of months, Stephen will be sharing some research on American religious movements, including a new look at Rochester’s Walter Raushenbusch.